"Cooking with Economy and Grace". I must have told 20 people about the book I'm reading, An Everlasting Meal by Tamar Adler. I usually don't mention that books take me ridiculously long amounts of time to read - I trudge through them so slovenly because I'm exhausted most nights when I finally lay down to read. I usually wake up some time after I've fallen asleep with a book open over my chest, to turn off the light and think to myself briefly that I'll try to get to bed earlier the next night. But no matter what time I manage to get to bed, the same scenario follows me. I'm on my 6th week of this book; I know this because check-outs from the library run in 3 week cycles. I frequently keep books 9 weeks before forced to return them, and actually it's in the 8th week that I'll really buckle down and finish reading a book - feeling as if I'm under an important deadline. Some cookbooks are perpetual check-outs, lining the shelf in my kitchen like old friends that I've rescued from dusty corners of existence. When I check my account online to see about renewals, I'll feel a sense of dread that my friends need to go back, to become friends to someone else. When my best new friends cause this type of feeling in me, that is when they drop into my Amazon cart - which feels bottomless at times, especially since I'm not buying anything extra right now. This feeling of thrift (which, for me right now, is an elegant term for "poorness") that I'm currently going through is overwhelmingly perked up by Adler's book. She is single-handedly making me appreciate every last scrap from my kitchen and garden, every dirty pan I reconsider before washing. She has validated me as a home cook, as someone who does pay attention to the sound of the sizzle in the pan, the change of a color, the scent of a crunchy onion as opposed to a cooked one. She makes me feel like I do have kitchen instinct, which she explains as coming from a combination of "in", meaning "toward", and "stinguere", meaning "to prick". "It doesn't mean knowing anything, but pricking your way toward the answer, " she says. She talks at length about good bread and using it to make toast. 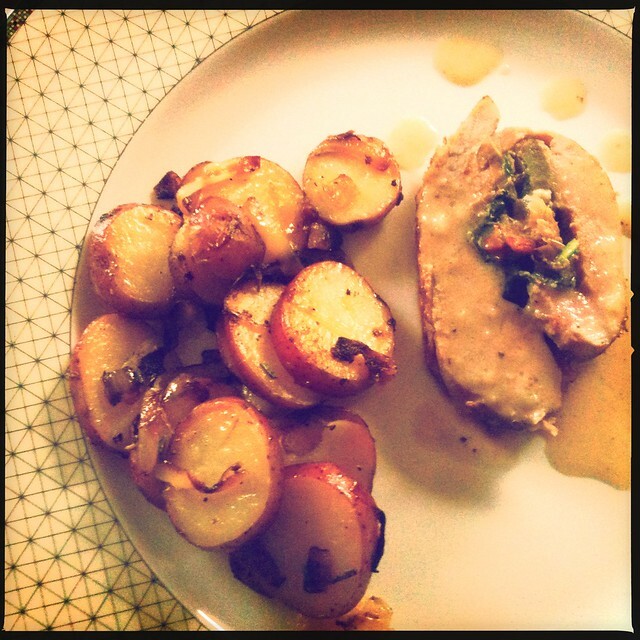 That whole meals can be made of toast - and that they are the perfect foil for vegetables. I was overjoyed to read this. Most of my lunches are toasted "old" bread with some kind of vegetables and cheese. I often think to myself how Kingly I eat, knowing where each ingredient comes from, knowing the time and feeling of the dough I made to bake into bread. 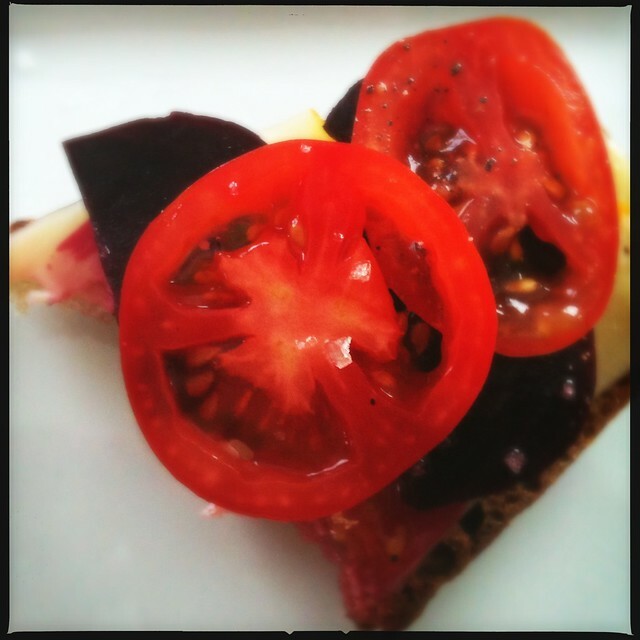 toasted bread, "red wax" gouda, roasted beets with salt, pepper and oil, farm market tomato, tellicherry black pepper. I recently read this post by Tigress, where she admits that she hasn't canned anything since June. I'm not far behind. I don't need to make dilly beans or pickles this year, and I shouldn't be making any more jam. Last Summer was one of gusto, and I'm still admiring the bounty. I do this sometimes, I hoard what is on the cellar shelf. That lemon marmalade I made one day in early Spring (2011)? I still have a jar left. I have 2 jars of preserved kumquats in the fridge, alongside so many "Woodwife Peppers" that are nearing a year old and I'm unsure if I should eat them (except that they are sooooo salty, I'm sure nothing bad could live in them). The heat that has overwhelmed the Midwest this Summer found me neglecting my garden (though it is much smaller and less productive than the mighty Tigress's). The stifling heat made me intentionally forget a half dozen radishes in the ground, which grew surprisingly tall and bloomed in pretty white or purple flowers. 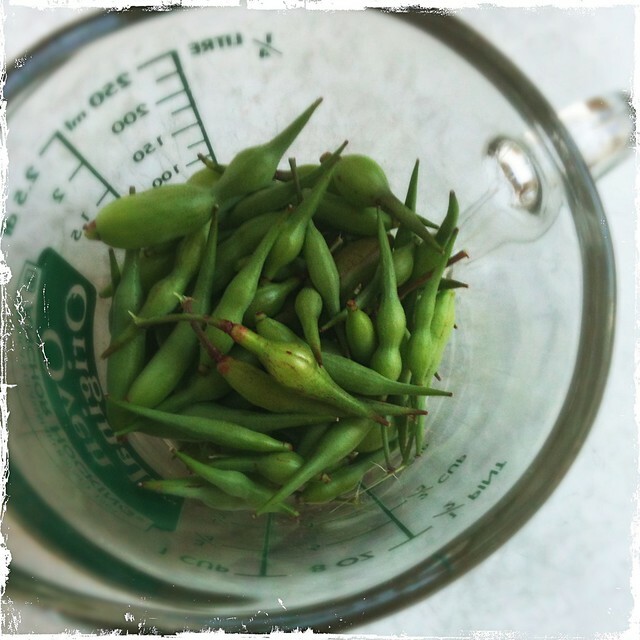 Yesterday at breakfast, I was paging through Linda Ziedrich's Pickling book, and found a recipe for pickled radish pods. After clearing the dishes, I stepped out into the lung-filling heat and picked a small amount, enough for a quarter amount of Ziedrich's recipe. I packed them tenderly into a little glass yogurt jar, topped by the modest amount of brine, and twice as many dried cayenne peppers than called for that were from my garden last year. 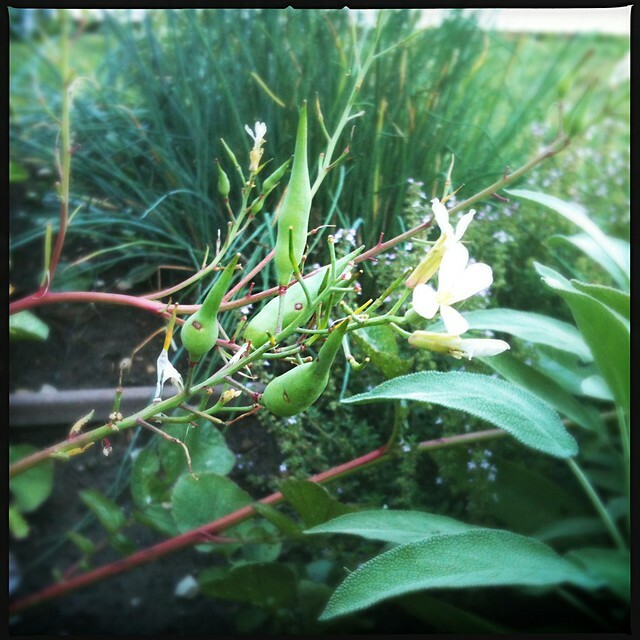 If you plant some radish seeds now, and just forget about them for about them for 6 weeks or so, you should be able to harvest enough pods for a full batch of pickled radish pods. I got about a cup of pods from 2 radish plants, so I'd figure that 8 plants would give you enough for the pint called for. 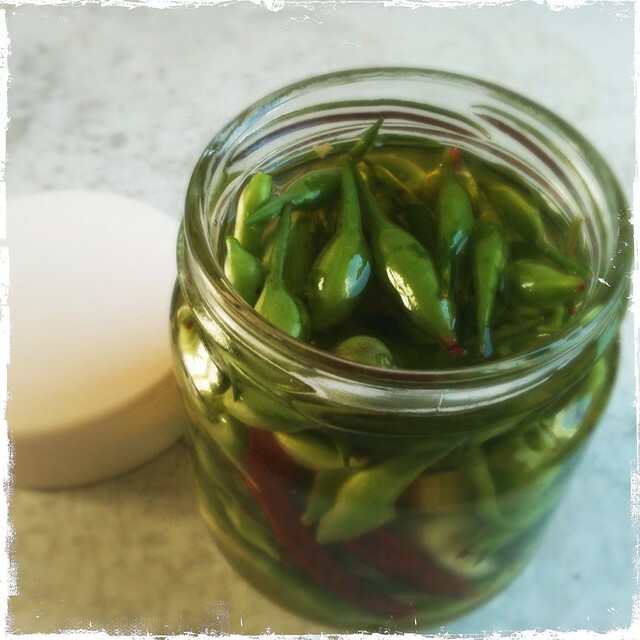 Pack a clean jar with the radish pods, hot pepper(s), tarragon, and garlic. Stir the vinegar, water and salt together, and pour over the pods covering them and leaving about a 1/8 inch headspace. Add the olive oil, and cap with non-reactive lid. Store for 3 weeks in a cool, dark place before eating. After opening, store in the refrigerator. 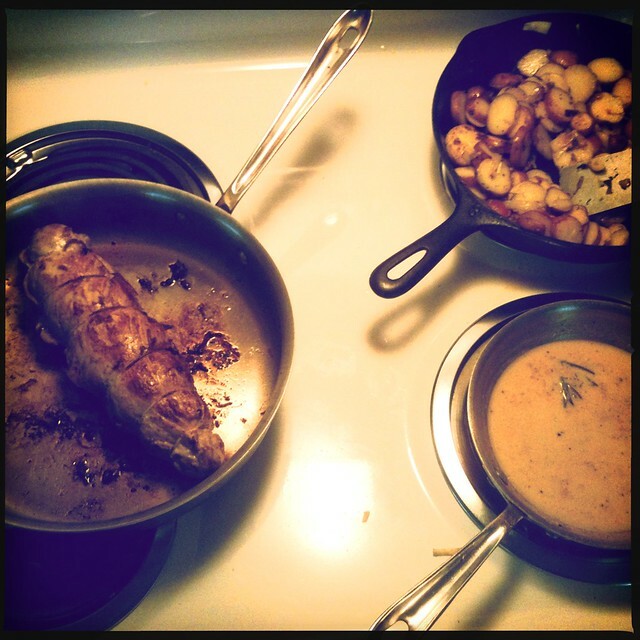 After my chef/friend and neighbor/coworker/friend dinner (the one in which I served the Gâteau Basque), I was left a whole, stuffed pork tenderloin to make. I cooked it last night, thinking again about the kindness of friends, and the things that come to inspire me when I need it most. I watched my friend make a sauce for the pork (I would never have thought to make a sauce). She used beef broth that I had made from bones I carried back from a steak dinner we grilled out at the farm when I was on vacation. The beef broth made with 4 diners worth of bones was exceptional, and it made about a quart of richly flavored stock. I watched her adding and tasting; we found a bottle of apple cider syrup I made last year and never used on anything. Her sauce was delicious. I figured I'd try to make a sauce when I made the leftover pork - and I began mine in pan of leftover melted butter I had made the night before for our popcorn. I sliced the garlic in, brought up the heat and let it sizzle. I added beef stock and a sprig of rosemary, thickened it slightly with flour mixed with heavy cream, and baptized it after with a splash of cheap brandy (that I got from a friend, so that we could share in the bounty of another season of bachelor's jam). 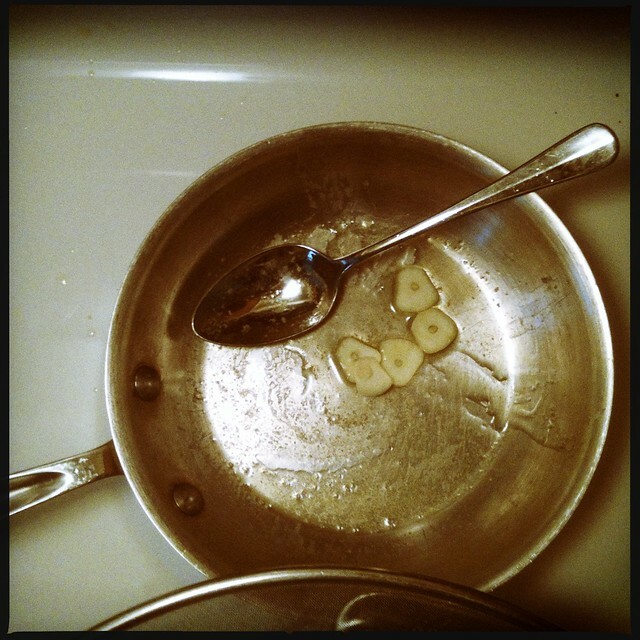 The potatoes that I had insufficiently braised in the stock to begin with became homefries, because I had not cooked them long enough the first time, they gained momentum combined with onion and more rosemary, and the incomparable heat of a big cast iron skillet. I had just enough of them leftover from dinner to use for breakfast, alongside some perfectly fresh eggs, a gift of my Parents when back home. All of these things add up. To the point sometimes that I have no words to describe them. I have enough leftover pork for several days of delicious sandwiches, I am making a new loaf of bread today to take us through the weekend. I have a fridge full of already roasted vegetables, marinated cucumbers from my struggling garden plot, and the validation that I am a good cook without credentials, that I can cook from what seems like nothing in the house so long as I remember not to throw anything away. There is always something new to be learned, something more to be thankful for. Beyond everything else, I know I am being looked after by the Power on high, in gifts of cupfuls of peas and vacuum cleaner bags, in stuffed pork tenderloins and sincere new friendships. All of these things allow me to cook with economy and grace, just as Tamar Adler suggests. They allow me to "prick my way" forward, finding my way in uncertain time.